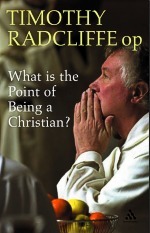 The Archbishop of Canterbury, Dr Rowan Williams has announced that the winner of the Michael Ramsey Prize 2007 for theological writing is What is the point of being a Christian? by Fr Timothy Radcliffe. Speaking at the National Christian Resources Exhibition, where the £15,000 prize was presented, Fr Timothy, a master of the worldwide order of Dominican Friars, said: "I'm thrilled to have won because I have a tremendous admiration for Archbishop Michael Ramsey, whose deep theology and wide-open heart moved Christians so much closer together. "A lot of theology is seen as boring. It doesn't seem to intersect with the way we think and talk. To do theology today you have to begin with the films people have seen, the books they have read, the songs they listen to. "Our parents grew up with the assumption that everything is getting better. We've lost that confidence with things like imminent ecological disaster and the War on Terror. We have to find a much deeper basis for our hope." Tim, who had flown in from the United States to attend the ceremony, added: "On Kentucky Derby Day recently, Dominican came 11th - so it's good that a Dominican should be first past the post at Sandown Park!" The biennial prize commemorates Dr. Ramsey, Archbishop of Canterbury from 1961 to 1974 - and his commitment to increasing the breadth of theological understanding of people in general. It was inaugurated by Dr. Williams to encourage the most promising contemporary theological writing and to identify it for a wider Christian readership. Speaking to the BBC, Archbishop Rowan said: "The book shows you what a difference it makes being a Christian and it does so in many ways. There is something very fresh about this book - and very comprehensive." 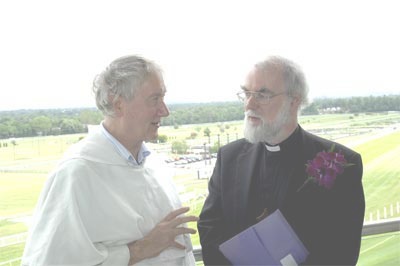 Fr Timothy Radcliffe, winner of the 2007 Michael Ramsey Prize, with the Archbishop of Canterbury, Rowan Williams, at the awards ceremony.